Almost 75% of residential energy consumption in the US is related to water heating, space heating, and space cooling. 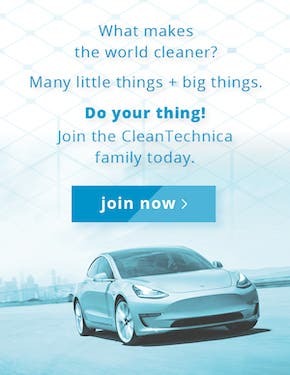 According to the Solar Energy Industries Association (SEIA), 115 million homes consume $266 billion of energy annually, which is roughly the same as sending 10 million Americans to college every year. Likewise, 4.8 million commercial buildings consume $107.9 billion of energy annually, of which approximately 47% is related to heating and cooling. With so much energy consumption in the US directly attributed to the heating and cooling of air and water, solar heating and cooling can play an important role in providing economically viable and environmentally sustainable solutions for supplying these essential needs. Solar heating and cooling can also play an important role in mitigating the impact of global warming. A single-family home with a solar water heating system installed will reduce its CO2 footprint by an average of 28%, according to the Solar Energy Industries Association (SEIA). With a combination solar air + water heating system, this reduction in CO2 can easily exceed 60%. Likewise, businesses and manufacturing plants with high makeup air volumes will achieve similar CO2 reductions with the installation of solar heating and cooling systems. 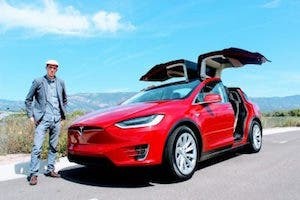 Significantly reducing America’s dependence on imported fuels, solar heating and cooling (SHC) systems already represent an important intermediary step in the transition to the solar energy era. Made popular decades ago as an efficient means of heating outdoor swimming pools, solar heating and cooling is now commonly used in residential, commercial, and industrial applications for heating and cooling both air and water. The SEIA reports that over 30,000 solar heating and cooling systems are installed annually in the United States, employing more than 5,000 workers across America, and generating an estimated $435 million in revenue. However, US market penetration of solar heating and cooling is low, with only 9 gigawatts thermal (GWth) of installed capacity. In China, on the other hand, solar heating and cooling systems are being installed at a rate 10 times higher than in America. Thermal energy can be generated from many renewable sources, such as solar, biomass, and geothermal. These systems are known collectively as renewable heating and cooling technologies. Systems which change sunshine into usable thermal energy are referred to as solar heating and cooling (SHC) technologies. Measurements of thermal energy are often expressed in British Thermal Units (BTUs), which represent the amount of energy needed to raise the temperature of one pound of water by one degree Fahrenheit. BTUs, or “therms,” are easily converted into kilowatt-hours (kWhs). Capturing the sun’s energy through solar heating collectors, the heat is efficiently transferred into buildings for heating and cooling purposes. Solar heating and cooling technology is easily recyclable and non-toxic, consisting mainly of copper, aluminum, steel, and/or polymers. SHC systems are appropriately designed to meet a building’s specific space and water heating and cooling needs. Meeting the energy needs to heat water for the average American home can be achieved with only one or two solar heat collectors, which require around 60 square feet (ft2) of roof space. However, more northerly states with significantly colder weather than average temps may need a larger number of solar collectors, roughly requiring up to 400 ft2. There are several types of solar collectors, including flat plate, evacuated tube, Integral Collector Storage (ICS), thermosiphon, and concentrating. Flat plate collectors are the most common type of collector in the US. 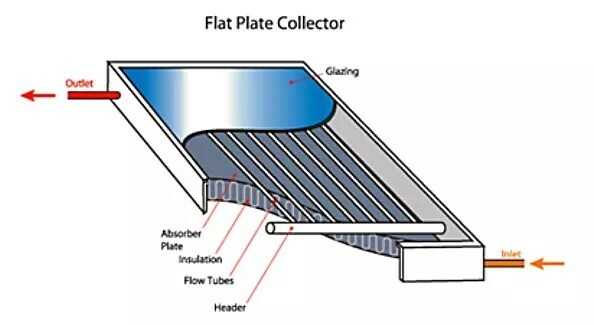 Flat plate collectors have copper pipes attached to an absorber plate contained in an insulated box that is covered with a tempered glass or polymer coverplate. Evacuated tube collectors consist of rows of parallel, transparent glass tubes that have been “evacuated” of air, creating a highly efficient heat insulator for the fluid that runs inside the length of the tube. Evacuated tube systems are generally used when higher temperatures or higher volumes of water are needed, as well as for process heating and solar air conditioning systems. Simple unglazed collectors are typically used to heat pool water or preheat large volumes of industrial process water in warm climates. Flat plate, concentrating, and evacuated tube collectors use transparent cover plates or glazing, metal, or polymer absorbers, and insulation to efficiently produce heat at higher temperatures. While most solar collectors are commonly used for water and space heating at temps up to 200°F, concentrating collectors are useful in industrial and manufacturing processes because they can produce heat in excess of 300°F–400°F. Solar air heating systems typically use a non-toxic liquid, water, or air to transfer heat from the solar collector. 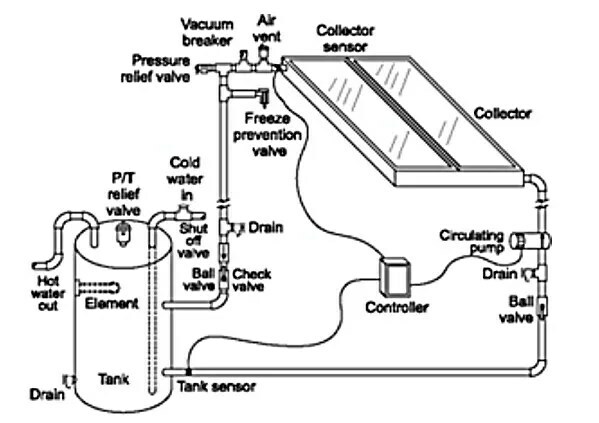 Heating water or an antifreeze solution, liquid-based systems circulate the heated liquid through a heat exchanger connected to a storage tank. 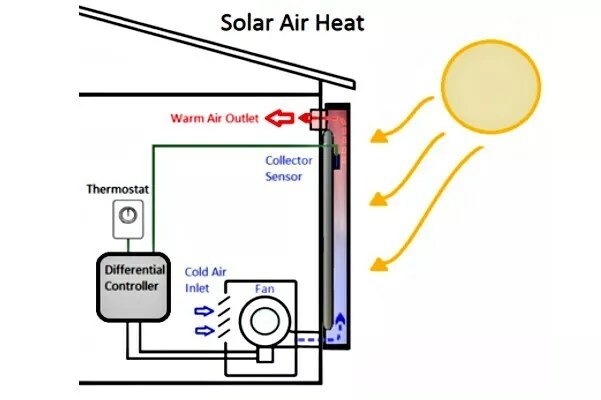 Air-based systems heat air in a solar air collector and then fans distribute the heated air, circulating it around the home or property as needed for space heating. Energy storage technologies may also be employed with solar heating systems to provide heat when there’s no sunshine, and at night. Energy storage may also be used with solar cooling and solar water heating applications. An alternative form of solar space heating uses vertically installed transpired solar collectors on the southerly wall. Transpired solar collectors have perforations in them which allow the air to enter, heating it as it rises. As the heated air rises to the top of the wall, it is directed into the ventilation ducts of the building for distribution as space heating. Solar cooling applications are very useful, as air conditioning represents a major strain on the electrical grid when weather is very hot outside. Using this same heat and strong sunshine to produce solar air conditioning is an ideal solution to reduce this strain. Also referred to as solar-assisted cooling, properly sized residential solar cooling systems may also be used for space heating during winter months. Absorption chiller systems and desiccant systems are the two types of solar cooling systems. The most common of the two is absorption chiller systems, which use solar water heating collectors and a thermal-chemical absorption process to generate air-conditioning, with no electricity used in the process. The process is very similar to a refrigerator, except that a compressor is not employed in solar cooling. Instead, heated liquid from the solar collector drives the absorption cycle. The second type of solar cooling system is a desiccant system. Air is cooled by passing over a common desiccant such as silica gel which draws out the humidity from the air, making it feel more comfortable. Solar heat is used to dry out the desiccant, regenerating it for reuse. SEIA reports that over 9 million residential water heaters in the US are replaced every year, creating a great opportunity to transition to solar water heating. The cost is relatively low, and most home solar water heating systems can be easily installed in one day. There are two types of solar water heating systems: active systems, relying on an electric pump to circulate the water, and passive systems, which use thermodynamics to move the water. Active solar water heating systems are the most common in the US for both residential and commercial applications. Solar water heaters are composed of three main elements: the solar collector, insulated piping, and a hot water storage tank. Electronic controls can also be included, as well as a freeze protection system for colder climates. Solar radiation hits the solar collector, the solar collector absorbs the heat and transfers it to potable water in the system. Flowing out of the collector into a hot water tank, the heated water is available and used on demand. With the freezing temperatures of colder regions, an indirect system is used. In this case, an antifreeze solution, such as non-toxic propylene glycol, is heated in the solar collector and flows to the heat exchanger on the hot water storage tank. The heat exchanger transfers the heat from the antifreeze solution, warming the storage tank filled with potable water. This hot water is used on demand, while the antifreeze solution recycles back to the solar collector for reheating. In either case, a properly designed and installed solar water heating system can provide up to 80% of a home or building’s hot water needs. The widest use of solar heating technology in the US today is solar swimming pool heating. According to SEIA, over 30,000 solar pool heating systems are installed every year. Because of the ease of installation and rapid payback period, nationwide acceptance of solar pool heating in the residential sector has been consistently high over the past 35 years. Depending on the climate and whether the pool is located indoors or outdoors, the solar pool heating system will require the appropriate solar collector. Heated water then flows from the solar collector through the swimming pool’s filtration system to transfer the heated water into the pool. 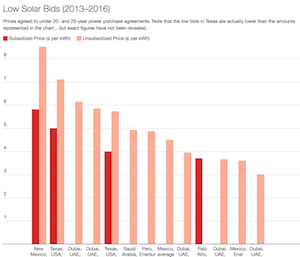 Residential solar water heating systems typically range between $6,000–$10,000, according to SEIA, depending on system type and geographic location. This cost is significantly reduced by the Federal Investment Tax Credit (ITC) and various local, state, and utility incentive programs. 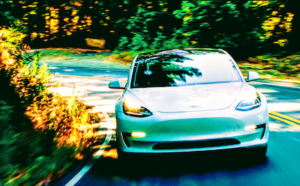 The out-of-pocket price of installed systems is typically $3,000–$5,000 with these incentives, and the payback period is typically in the 4–8 year range. Typical commercial applications include space heating, cooling, and water heating. Building types that are particularly well-suited for these solar applications, according to SEIA, include “military facilities, manufacturing plants, large multi-family residential buildings and affordable housing, municipal facilities, hotels, elderly and student housing, hospitals, sport centers, and agricultural operations.” Commercial and industrial systems generally range between $20,000–$1,000,000, depending on size and the heating or cooling load. Depending on application, location, and financial incentives, the payback period for commercial systems can be likewise as low as 4–8 years. 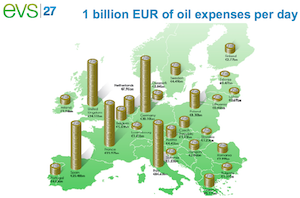 SEIA notes that capital expenditures (CAPEX) for solar heating and cooling systems are often higher than conventional fuel systems, but on the other hand, operational expenses (OPEX) are much lower because the fuel is generated and supplied for free. Budgeting fuel expenses becomes a thing of the past, lowering OPEX significantly with the transition to clean, renewable solar heating and cooling technologies. The small residential sector represents around 80% of the current solar heating and cooling market volume in the US. By expanding solar heating and cooling systems to generate around 8% of America’s total heating and cooling needs, SEIA estimates that this could displace an equivalent of 64 coal plants, or approximately 226 million tons of offset carbon emissions every year. “Solar Heating & Cooling: Energy for a Secure Future,” developed by SEIA-member companies and BEAM Engineering, lays the groundwork for achieving this 8% by driving installed solar heating and cooling capacity from today’s 9 GW thermal to 300 GW thermal by 2050. 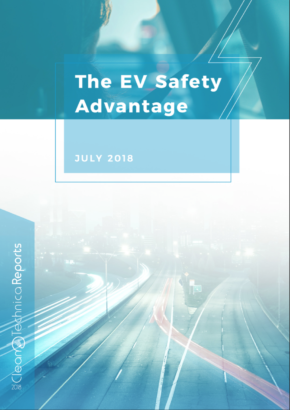 SEIA predicts this would bring more than 50,000 good-paying American jobs and an estimated $61 billion in annual energy savings for homeowners, businesses, schools, and governments.